Homes in Solera Chandler AZ are in great demand! You are here: Home / Solera Chandler / Homes in Solera Chandler AZ – See Video! Want to Relax and Enjoy the Perfect Retirement Community? Homes in Solera Chandler AZ are in demand. And, if you are considering a home in a gated retirement community, now is the time to set up the search and watch the market. Inventory has been low this past year, but we can help you find the perfect home in a great community! Although many residents will head north for the summer months, homes will remain available and we have the resources to locate a home for you, even in the summer months. Solera is a Dell Webb master planned gated retirement community located in south Chandler. Homes are set amidst the gorgeous San Tan Mountains in this small community of 1,149 homes. This Solera community is much smaller than Dell Webb’s Sun City communities and yet offers a quiet intimate serenity and resort amenities. Today’s active adult retirement community buyers are seeking the amenities available including a golf course, tennis courts, swimming pools, clubhouse with fitness center, hobby studios as well as walking and biking trails! Homes are single level with private back yards or views of the golf course or greenbelt. Homes in Solera Chandler AZ are selling quickly when priced accurately and move in ready. 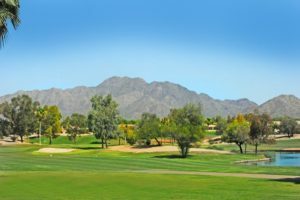 If you are looking for homes in Solera Chandler AZ or any active adult retirement community, you need the expertise of a Realtor who knows the area, the trends and the market values. The Kolb Team lives in a gated active adult retirement community and has sold over 80 million in real estate. We can help you find the perfect home that fits your lifestyle. See the Arizona active adult retirement community video featuring Solera, Sunbird and Sun Lakes AZ below. And, then call us at 480-440-0849 or contact us here for more information.